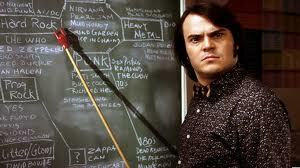 School of Rock was the film that first put Jack Black on the radar of many people (myself included). In this guest post, Chris from the fantastic Terry Malloy’s Pigeon Coop sees how it holds up. Say what you want about Jack Black but when he finds a role that fits, he can give some pretty entertaining performances. School of Rock (2003) doesn’t just fit with him; it’s the perfect fit. When it came out in 2003, Black was at the height of his Tenacious D fame and so the combination of film and over the top music was a match made in heaven. Granted, if you really can’t stand Jack Black then this film is probably not the one that’s going to change your mind. Black is his usual brash, in-your-face self which many (including myself if not in moderation) can find grating. Yet here it all seems appropriate. For the uneducated, Black plays Dewey Finn, a wannabe rockstar who essentially commits identity theft to work in a primary school under the guise of his best friend Ned Schneebly (Mike White). Whilst working at the school, Dewey makes the class take part in a ‘special project’, one long music lesson leading up to a Battle of the Bands competition which will allow him to fulfill his rock ‘n’ roll dream. Yes it’s utterly ridiculous and it would never happen. First of all, there is no way a school would make such an idiotic mistake in letting him teach in the first place. Then, if he did actually manage to get the job, threaten to ruin several children’s education, then basically kidnap them when he takes them to the Battle of the Bands, he would be looking at a lengthy spell in prison – not open up his own music class and suffer no consequences whatsoever. But hey, that’s not really what they were going for so I think it’s fair to overlook all that. I think the real reason I like this film is that I see myself in Dewey Finn (not like that, stop sniggering). My dream job is to be in a band and therefore I can empathise completely with Dewey and his failed ambition. I’ve been the one noodling away in my bedroom to my favourite bands pretending there are thousands of people looking on, swigging Jack ‘n’ Coke and giving it the devil horns. I’ve even played with actual real people at times but, alas, I’m no rock star and never will be. But I do get Dewey’s frustration and, after all, identification with a character often makes for a better film. However, I definitely wouldn’t have stolen someone’s identity and kidnapped some kids to live the dream. Just making that clear. Of course, it’s important for a film with rock music as a theme to have a good soundtrack and School of Rock doesn’t disappoint. It has music from legendary rockers such as AC/DC, Black Sabbath, The Doors, Ramones, The Who, and more, which all just add to my enjoyment. 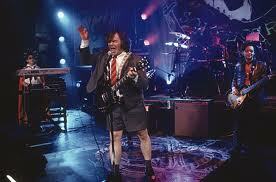 School of Rock is immensely silly but there are plenty of moments that make me laugh, probably more than I should. Is calling a fat kid ‘Turkey Sub’ offensive? Maybe. Is it childish? Definitely. But it still makes me chuckle. It’s a real guilty pleasure of mine but one that I’m happy to admit. No, thankyou man. Tis a cracking review. Tim over at Not Now I’m Watching a Movie and Drinking a Beer is running a Jack Black showcase, A Week at Bernie’s, of which I am a part of with my look back at School of Rock and why I love it. He’s also offering the chance to win Black’s Bernie on DVD. Head on over and check it out. Excellent! I really enjoyed this movie and the review! I am right there with you on both of those.